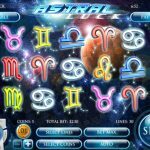 Released in 2012, Astral Luck is a slots game by Rival for those of us who love to look up into the skies. Do you think your zodiac sign should bring you luck? well Astral Luck gives you the chance to really prove it. No need to read all about your sign in the daily newspaper cause you can just test this premise live with this game. The game is a 5 reels and 50 paylines and Rival really loaded this game with everything they know to do like wild symbols, scatters, bonus round and nice multipliers. The Pisces and Capricorn symbols are the scatters symbols. The Pisces will trigger the bonus round when you get 3 or more. You will then be taken to a different screen and you will just need to choose randomly and win some cash prizes instantly. The Capricorn is the free spins scatter 3, 4 or 5 will give you 5, 10 and 20 free spins with a multiplier of 3x. 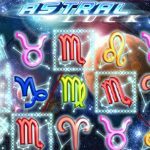 If you’re a fan of the zodiac and astrology then this might be the game for you. Otherwise it might take you some time to get used to all the new symbols. Still this game is fun and very engaging. Rival certainly did a good job with the graphics here. With some luck when it comes to the bonus features you will see a very nice return on your investment. You like old time tales? Try playing Arabian Tales a 5 reel slot by Rival.